Your hallway is the first thing that anyone (including you) sees when they come into your home. It gives an impression of how you live, and what the rest of the house will be like. They say when people buy a house they make a decision within 30 seconds – and this is true when coming into any home, you either feel comfortable and relaxed, or on edge and wanting to leave. Whether it’s you walking in from a hard day at work, or a guest invited for coffee (or just someone dropping by unexpectedly who can see the hallway from the doorway even though you don’t feel you can invite them in as yet because of the mess) – you want to get the relaxed and comfortable feeling. After all – why be faced with stuff to do as soon as you walk through the door? – that’s no way to live and day after day of this will drag you down. 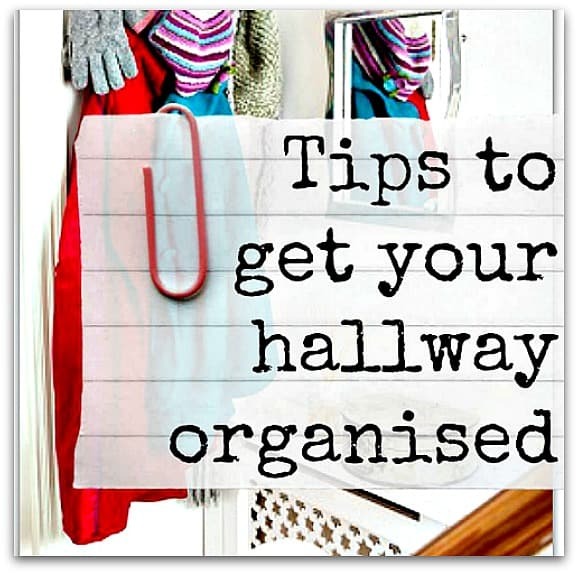 Here are some great tips to get started in your hallway – use one or all of them – but start somewhere and I promise you won’t regret it! Consider having a hook, basket and/or drawer for every member of the household so they always have somewhere to put everything as soon as they come into the house, and they know exactly where to find things when they are leaving. With very young children why not colour code these so they know whose is whose. This is great for school / work bags, phones, handbags, etc…..
Then get into the habit of hanging things up and putting them away in that space as soon as you come into the house, soon it will become second nature. If people know where to look for their stuff then they will become more relaxed, and its also a great place to put peoples things that have been left in the wrong space in the house as well so that they can tidy things up for themselves rather than you chasing them for it. Create room for guests coats and shoes by only storing the most used items in the hallway itself if possible. Change these on a seasonal basis (why have winter coats to have to push through in the summer to find your light jacket?). The rest could possibly be stored in peoples bedrooms, or loft space (space allowing). Minimising the amount of stuff in the space will help to make the space more spacious and inviting. 3. GIVE THE STAIRS A USE! If you have stairs then you can get a basket (they sell specific ones for this job) to put things in that need taking upstairs – therefore allowing you to take things up when you are going, while keeping it under control while its there. Make the journey up and down the stairs useful each time by taking something with you. If you don’t have a cupboard in this area, then consider having a large basket with a lid to house shoes – minimise the visual clutter as much as possible. 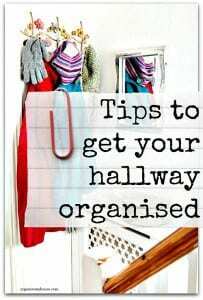 Keeping shoes neat and tidy and out of the way will make all the difference to your hallway. If you DO have a cupboard and its big enough, you may want to add a box for things that need to be returned or given away – then it’s visible to you and you will remember to take it when going to that location (i.e. library books, items for charity, borrowed items from friends etc…). Once you have a place for this sort of thing you may want to put it somewhere less visible (like the garage), but it may be worth it while you get into the habit. Ideally you will want somewhere to sit in this space – for people to put shoes on or talk on the phone – this would be great and a bonus if it had storage inside as well to make the space work harder. There’s nothing worse than having guests around, asking them to take off their shoes and coats, and then watching them struggle to balance, when a seat would make the job so much easier! Whatever you do – don’t let this area become a dumping ground – as it so easily can be. The hallway should still be regarded as a room in your home, as you use it every day multiple times. Keep items moving through the space that don’t belong there – add to the basket to take upstairs, take things back to their specific room asap – and get the rest of the family to do this too. Usually this is the area that the front door and therefore the mail comes to first. Along with that mail is usually a load of junk mail. We all get it, and rarely read it. Deal with it immediately and simply don’t allow it to get any further into your home. Put a bin near the front door so you can throw it away (ideally recycle of course) as soon as you get it. The hallway is is the obvious place to keep keys – but ideally keep them out of direct sight and away from the door itself (think about if someone looked through your letterbox what they would be able to see and get hold of if they had the inclination). It is wise to keep a spare set of keys with someone you trust who lives locally, so that you don’t have to have keys on the outside of your property hidden under plant pots etc.. Think safety at all times. However – I do advise not hiding your car keys too far – There are burglars out there unfortunately wanting to steal cars, and just doing smash and grabs on your home (it has happened to us), and if they can find your keys easily then they won’t disturb you – I would much rather they took the keys and were gone than the alternative…..
Having a mirror close to the door is a great trick as its so useful to check yourself before you leave the house one last time. Ensure there is a mat to wipe feet (saves you time cleaning the floors! ), and don’t be shy to ask guests to take their shoes off in your home to again save cleaning. I personally think this is just good manners to do so, and shows people that you are proud of your home which can’t be a bad thing! Even if you don’t deal with your post here – you may want a small basket to put post into so that people know where to look. Have a basket for all the items you need each season – so they are easy to grab as you are walking out the door – i.e. for winter – umbrella, torch, scarves, gloves, hats, and for summer – sunscreen, sunglasses, picnic blanket, sun hats. (another good place for this is the utility – whatever works best for you and your family. These are things that may waste time each day and that time soon builds up. This is your way of welcoming people into your home, and sets the scene, so lets make sure its a good scene! Previous Post: « WHY ARE YOU GETTING ORGANISED?